Francine Shaw-Whitson, of the FHWA’s Office of Transportation Performance Management, makes a point during her presentation at the Mid-Continent Transportation Research Symposium. What is believed to be a record turnout participated in the 2015 Mid-Continent Transportation Research Symposium, August 19-20 in Ames. The biennial event was sponsored and run by the Institute for Transportation (InTrans) at Iowa State University and the Iowa Department of Transportation (DOT). The Midwest Transportation Workforce Center at the University of Wisconsin-Madison and the Wisconsin Department of Transportation also sponsored the event. Among the 365 registrants, who were from 11 states and Canada, 159 were from the Iowa DOT, and 105 from ISU. A total of 78 students from several universities, 16 county engineers, and one city engineer also attended. The 24 concurrent sessions featured nearly 80 presentations on 14 broad topics ranging from safety to bridges and structures to intermodal topics. Five presentations featured discussions on implementation of research results to practice. Among the Federal Highway Administration presenters were Francine Shaw-Whitson, team leader, and Tashia Clemons, transportation specialist, from the Policy and Guidance Team of the Office of Transportation Performance Management in Washington, D.C. The featured symposium speakers were Paul Trombino, director of the Iowa DOT, and Michael Crum, vice president for economic development and business engagement at ISU. 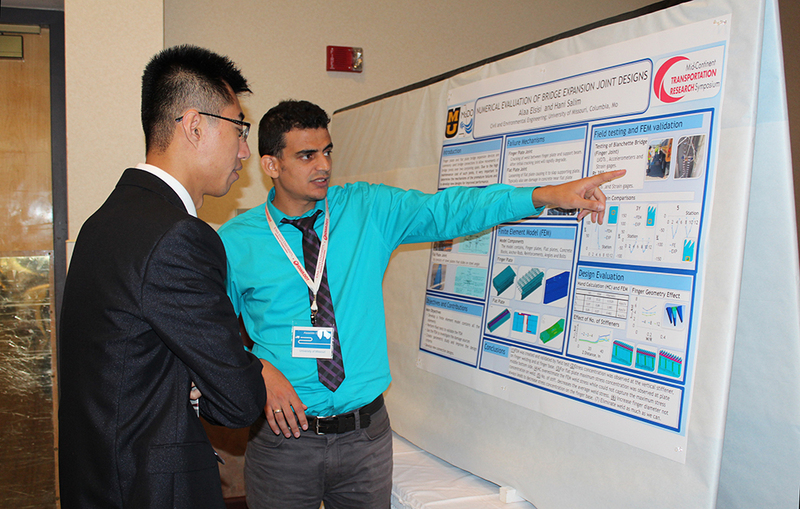 laaeldin Elsisi from the University of Missouri-Columbia, explains his research during the poster session reception at the Mid-Continent Transportation Research Symposium.